For an eye-catching addition to your carnival, fair, theatre, or party, use this Carnival King popcorn bag to serve up hot, buttery popcorn. Each 3 1/2" x 2 1/4" x 8" bag has a fun and vibrant white and red design with the words "Pop Corn" in a featured circle! Perfect serving size for popcorn, not too much but not too little that it leaves you wanting more. Read the reviews if you're looking for a bigger size, this fits 2 cups without spilling over. The size is good. The style is classic. Should be the perfect size for smallest popcorn bag. Will see in next coming event. Not that small. The were a little smaller than I thought they would be, but they worked great. They maybe hold 2.5 cups of popcorn. They don't have flat bottoms so the bags don't stand up on their own when filled. I received these quicker than I thought and they were good quality and a lot for my money. Better price than I had been paying. Popcorn bags are perfect size for the ballgame concessions. They are a little thin and do tear easy but otherwise great to use and cost reasonable. These popcorn bags are perfect for a movie night. My kids love how they have their own bag. It's a good size and good a good amount of popcorn. I use these bags for all my concession stands and giveaways, they hold up well and dont get soaked with oil like most bags. there sturdy and can hold popcorn great! These work great for kids as well as adults, and really gives a nice feeling when your handing them out before a movie or at a party. I prefer using these over just a big popcorn bowl, especially since the kids love them. Awesome bags!!! From the description I thought they were going to be too large for what we were using them for ( welcome popcorn for wedding guests) but they are the perfect size. The size of filled bag fit great in one hand and isn't too large where one person would feel silly having bag to self, or too small to share. The butter/oil doeskin leak through the bag, really a great product especially for the price. As a bar that gives out bags of free popcorn that we pop in our kitchen (all day, every day), we go through a LOT of popcorn bags. This size is great! Big enough that people don't just end up with a handful of unpopped kernels, but not so big that they are too full to order & pay for food from us. I work in a senior building and we make popcorn every week for the residents. This is the perfect size for senior. The price is very good to. Individual sized popcorn bag for commercial or movie popcorn machines. Bought these to replace the bags that came with the popcorn maker and they work great. 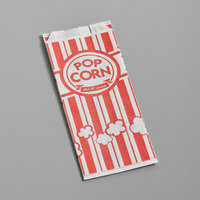 A nice looking traditional popcorn bag that is perfect for our schools carnival. The one ounce bag size is great for snacking and the bags are very well made. A nice purchase. These are great popcorn bags! They come in a pack of 100. I use them with my popcorn machine, they are the perfect size. Great price too. I love these bags! I have used them for a baseball party, a carnival party, movie night and more. They are classic looking red and white. Excellent value. A really nice quality popcorn bag at a really nice price. The one ounce bags are great for personal serving and are perfect for our parties. Awesome product for a great price. It's the perfect amount of popcorn for a party, but if it's to sell, I would suggest the next size up. Perfect size bags for one person. These little sacs make you feel like you're at a carnival. I will definitely be ordering more once these are gone! I use these from time to time to put kettle corn in. When I do an event in which the customers are going to eat the corn right away these do the job. They are a little thin and flimsy so you have to be careful when bagging so you don't rip them. Other than that they are a perfect single serve size. 1000 case of popcorn bags! Just like going to the movies you can now make it at home and use these bags for movie night!! A great addition to your home entertainment nights. Bought this for an event at work. Perfect serving size and the design really adds to the fun!!! Overall we have found that free popcorn improves employee morale and makes an inexpensive treat! Carnival King popcorn bags are top of the line! I was hesitant to order so many bags as they are for personal use with our popcorn machine but was surprised how quickly we are using them. Perfect for serving popcorn for VBS snacks and summer parties. Inexpensive too. We use these popcorn bags at our shop. They are easy to fill and seem to be the perfect size for a popcorn snack while our customers are walking around our shop. Perfect for portion control! It makes sure that everyone is getting the same amount and that we are wasting popcorn. They don't take up lots of space so they can be stored and saved. This is a perfect size popcorn bag for an event. If you are having a party in your back yard or enjoying some popcorn at a BBQ, this is the perfect size bag! I've already purchase multiple cases. Perfect size for the party we catered. We will also be using these for every day use to offer popcorn and caramel corn at Our store. These bags are very strong and so nice. I like the way it holds the pop corn and is so easy to grab and eat it. Super fast shipping! I really liked that and like the fact that the bags are so pleasing to the eye. I like to have this size bag on hand and share with my family and friends when we have get together's. Thanks web restaurant for such a wonderful product!! I had a carnival coming up and realized I was out of bags. I ordered these and they came even faster than expected! Excellent service! These are perfect for our snack shack small popcorns. The bags hold just the right amount and they look good. They arrived way before we exspected. I love these popcorn bags. I used them for family night. It makes cleaning up easier because they are disposable. They are also perfect for church events. THE LOOK OF THE POPCORN BAGS MAKES IT A BIT MORE ENTICING. I LOVE THE ECONOMICAL SIZES AND THE PRICE FOR EACH CASE MADE ME VERY HAPPY. THX WEBSTAURANT. Carnival King 3 1/2" x 2 1/4" x 8 1/4" Popcorn Bag - 1000 / Case are perfect bags for carnivals and such. They are a great price. These bags are small and perfect for selling small quantities for impulse purchases. We sell the popcorn for $1.00 each. My only complaint is that the bags bleed if they get a drop of water on them. One drop of water on a stack of bags would probably bleed pink water to through a couple of them. Received this bag today. Just the perfect size for a "small" order. The Bright red color of the bag is awesome. We have tried to stay with a carnival theme and this bag is perfect for what we want and need. Very fast shipping, great quality and bags are an awesome size. We have concession stands at our petting farm and these work fantastic. Will for sure be ordering some more boxes to have on hand. Would recommend. These bags were a perfect size. When you have concessions and the food has to be consumed away from the show or concert, they work great as a quick snack. We bought these bags for are consession stand and they work perfectly.We sell our popcorn for a $1.00 so these are the perfect size and look really good. Customers really like these. "Fun" to eat out of and I find that it is the perfect proportion for a snack size of pop corn. These are great popcorn bags for use with fundraisers. The bright design draws in customers and the serving size of 1 ounce is perfect for making great margins. I would definitely order these again. These bags hold up pretty well; however, I had a hard time using the popcorn scoop since I'm left handed. I ripped quite a few bags trying to get the popcorn inside. Other than that, good product. I really went back and forth trying to find the right size bag for the popcorn stand at our school carnival. We were charging $1 and I wanted to make sure we were able to make money on it (not too big) and that people were still getting a good helping for their money (not too small). These were the perfect size and are a good quality. As stated, small but simple size for our carnival themed event we had. We didn't need quiet as many bags, but its always nice to have extra in case. Nice bright colors! Perfect size for concession stands, movie night parties and more. I sell them in my online shop and pair them with fun movie night trays too! We love these popcorn bags. They hold just the right amount for our movie nights. An economical choice to hold our hot, buttery popcorn. Yum! We picked the perfect popcorn bag. The size is enough for the average customer to eat alone and still share a few bits with a friend if they're feeling generous. However this size allow us to sell at a rate where everyone in a family can buy their own bag of fresh popped corn. These popcorn bags were a great size and very good quality. We did not have any problem with them ripping or coming apart when we used them. Cheaper than what I could find in our local stores. Shipping was very quick. Nice, small-medium sized bag, which is great for parties. I have a popcorn maker at home and it was a huge hit at my son's birthday party. These bags let everyone serve themselves and feel like they are at a carnival. Great price too for a ton of bags! Perfect. The size is exactly what we needed, and they are substantially more sturdy than the price would lead you to expect. We will definitely continue to order these. These bags are the best quality we have found. Made in Indiana, they hold up to grease and oil well, they fit the standard popcorn scoops as well as french fry scoops. These give my popcorn a great look! I am always happy to find their product on this website...great bags for an even better price. They're strong and eye catching! I make a lot of popcorn for my kids and their friends. The 1 ounce popcorn bags are the perfect size for everyone! No bowls to wash!! We used these for a birthday party and the kids loved them. It made the party more fun for everyone. The only down side is that they can't be put down. Perfect portions and are great little bags! We use them with our popcorn machine at carnivals and it sells like crazy, everyone loves them and its just like at the old school fairs and carnivals! Deffinitely recommend and will buy from again! I decided to give this little bag a try and sure enough it is a hit. Matches the logo of my popper and really sells more popcorn with the bright red and orange colors on the Bag. This is a Great Deal. Doesn't hurt to have extra on hand. Yet again saving me money while staying at my place of business. Just the perfect size of popcorn for anyone, especially lil kids..perfect for parties and events.. nice design on bag to capture anyone eyes, good price ! Great promotional popcorn bags! Great items to offer to potential customers to create future business!! Great for old fashioned buttery popcorn as well as the sweet caramel covered popcorn!! The pop corn bags were the perfect size for a free give away during our grand opening. The size and quality were a perfect match to our high standards of customer servie and quality products. These bags are the perfect size if you are not actually selling the popcorn but are giving it away as freebies at an event. Will buy again! These are great little bags! Just the right size for popcorn giveaways. Little hands can hold onto these real well too. A very good value!! we use this at the concession stand we run for a local pool. it hold just the right amount of popcorn, and doesn't look skimpy. These bags are wonderful! They are very sturdy bags and hold alot of popcorn. My students have a bake sale every week and we sell the popcorn for .50 each. They are a big hit at our bake sale and everyone loves the bags. The popcorn bags are sturdy and strong! We will buy these popcorn bags again! Always can count of the WEBstaurant to deliver what I ordered and at a price that keeps us coming back over and over. Great Job Team!!! We have a client who used these for a kids carnival day at a daycare. They were a HUGE hit. An inexpensive way to set the mood! These are perfectly adequate single serve popcorn bags. Good price and visually appealing. Perfect for our hotel for the free popcorn. I'll continue to buy them.